Looking south on Union Turnpike from Kew Forest Lane toward the Kew Forest School. Click on images to enlarge and to find out more about them. I have an excellent web site for those of you looking for lost friends and relations www.ZabaSearch.com. I would love to know where students from 1966-72 are now. This is Shirley Chen, I lived at 124-18 Queens Blvd in Kew Gardens. Later in years I moved to Forest hills. Then California back to the lower East side of Manhattan. Graduated Washington Irving High. On into the U.S. Army, four children and a lifetime later I live in the state of Maine. E-Mail me and I will write more. ? Where are Carey Acosta and Douglas Domain.? Hello Everyone, My name is Carol Weekes formerly Carol Courts. I grew up in Kew Gardens. I graduated from P.S. 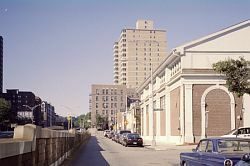 99 in 1977, and Russell Sage in 1980, and Hillcrest in 1983. My daughter graduated from P.S. 99 in 1997 and Russell Sage in 2000, and Richmond Hill in 2003. My oldest son graduated from P.S.99 in 1999 and Russell Sage in 2002, and LIC 2005. My youngest son is finishing 3rd grade in P.S. 99 this year. Many of you may know my recently deceased father Calvin Courts, he was the superintendent of 83-09 Talbot Street for many years. And he really loved Kew Gardens. My sister is the one who advised me of this site. I have some old photos and I'll try to get them to you. Thanks to Peter Jutro for a scan of the front cover of his official P.S. 99 Sixth Grade autograph book for 1955. Editor's Note: Further to our last Editor's Note on the subject, today's edition of The Amsterdam News carries an article about the landmarking of the Bunche House and the efforts to landmark the neighborhood. The link below will open in a new window. Close out the window to return here. My name is Michele Solomon. Lived in Kew Gardens from 1952-1974. Graduated P.S. 99 in 1964; Russell Sage Jr. High in 1967, Richmond Hill High School in 1970. Moved away from Kew Gardens after college graduation. Guide my email address wisely. My brother, Mark Solomon, also a graduate of P.S. 99, lead me to the site. It sure was fun seeing a couple of my class photos on the site. I went to the class of 67 reunion Friday June 10th... It was wonderful...Better than wonderful -----Little did we know way back then what a privilege it was to grow up in Kew Gardens... We had no worries about safety.... Kew Gardens was Rockwellesque...we had our good humor man Frankie and we had our Forest Park..........And of course our P.S.99 that started us all out on our lifes road. The idea of a PS 99 reunion all started way back in December of 2004. . My 50th birthday was coming up and I wanted to celebrate in a nostalgic way. So... began my quest to have a party with all my elementry school classmates, who were also looking at turning the big 5-0 with me. Through www.oldkewgardens.com and searching on the web we have found 39 classmates. After many months of planning a reunion for the class of 67', it finally became a reality this past weekend! We had a great time talking about old times. We passed around an old year book from Russell Sage. Lori and Peter G passed around their old autograph books. We all signed it again. The conversations always turned back to how great it was to grow up in Kew Gardens. Something we didn't realize until many years later. Saturday some of us met at Forest Park. We walked down to Dead Man's Rock [Click here and here] ( not so scary anymore). The highlight of the day was pizza at Danny's. Andre was kind enough to sit for a picture with Karin Wolf, Margaret Cella Flefleh and myself. We hope to do this again next year, so that some of you who missed it, can join us for the second-annual PS 99- ..Class of 67' reunion. In a June 11th. Guest Book letter Bea Swart seeks to locate certain medical records generated by the Kew Gardens General Hospital (80th. 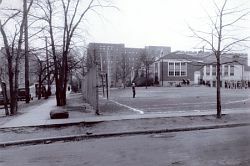 and Kew Gardens Road) while the facility was in operation. Unless the hospital was absorbed into or merged with another similar institution all records would be archived with the Department of Hospitals (125 Worth Street, Manahattan). Certainly, certified copies of birth records would be available indefinitely through the Department of Health Other documents regarding various procedures from as far back as forty or fifty years ago may no longer exist. However, if, by chance, such records have been preserved, I'd sure love to see an abstract of an appendectomy performed on me by my father in 1944! I am looking for the records of the Kew Gardens Hospital that use to be at 80-02 Kew Gardens Rd. Kew Gardens, NY 11415 in Queens County. Both my children were born in that hospital and it is very important that I locate the records. Does anyone know where the records are?? Both children now in their late 40s and early 50s went to Richmond Hill High School, although we lived in Woodhaven, NY. i use to live at 118-35 metropolitan avenue and im looking for two very special people whom lived in apt A-2,,,,Rosa and Jose. Rosa was a very special women whom traveled quite often to work in New Jersey while my mother would watch over little Jose and his deceased brother George. There apt was known for its special peep hole and was the only one of its kind when the building was once a hotel in the 1930 s. i will enclose a photo of Rosa,if anyone knows how to contact them please get in touch with me. Editor's Note: Thanks to Joanne Wisniewski for two photographs of her mother, Adele Timpson, taken at the Kew Forest School during the 1948 - 49 school year. Click here to view the article and story. 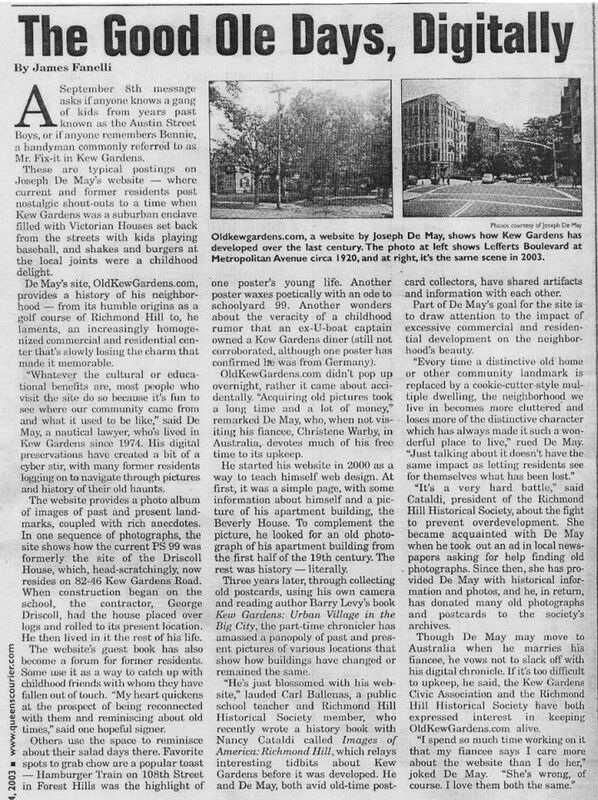 The article mentions a mystery photograph taken in 1910 from Grenfell and 80th Streets looking into Forest Hills Gardens. That mystery photograph also shows a small part of the pre-Interboro Union Turnpike. You can view it by clicking on the following link which will also open in a new window. I am a current resident of Kew Gardens, having only lived here for approximately 3 months. However, I discovered this site about a day after we signed our lease. I am a history buff and was determined to find out all that I could about my future neighborhood. And thanks to this site, I found all that I could handle. Seriously, this site is incredibly comprehensive, and allowed me to gain great insight into Kew Gardens, and have an appreciation for the area prior to moving in. I sympathize with all comments and sentiment regarding how much Kew Gardens has changed over the years, however I as well as all past residents should take solace in the fact that Kew Gardens (at least in my eyes) appears to have retained a significant amount of history. I also appreciate the fact that most businesses are mom and pops (so to speak) and not huge chains, and I hope this does not change. Anyway, I was hoping somebody out there might have an interesting fact, photo or tidbit about my current abode. It is located at 84-37 118th Street and is called the Caledonia.